Alice Peavley’s first surprise was when she found out that she had inherited the estate of her uncle Clarence. To claim it, she had to move to Darbyfield, the oddest town in all the lands of the Crescent Sea. Her second surprise was when she learned that her new manor came with a valet, Macalley, a gnome with a brilliant mind and a sardonic streak. And her third was discovering all the challenges that her manor, and life in Darbyfield, held. 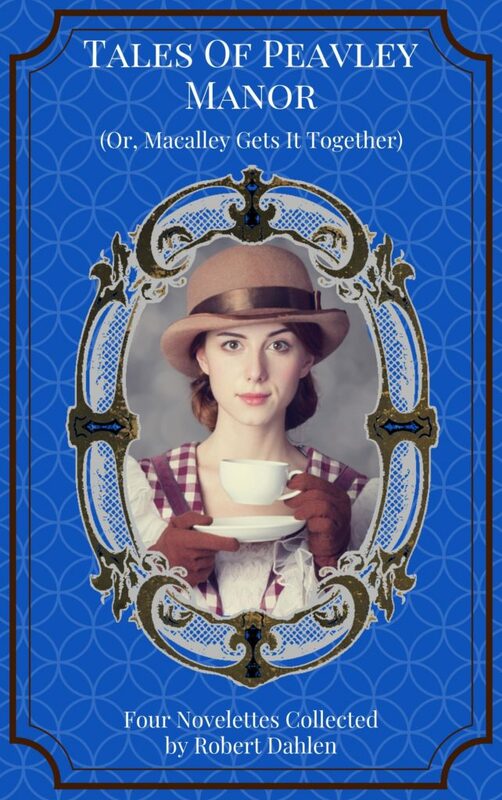 Feuding neighbors, arrogant elfin nobles, book pilfering, motorcar races, unwanted suitors, mysterious playwrights, ruthless villains, baking contests…Alice will face them all, and with cleverness, determination, Macalley’s assistance, and a good cup of tea, she’ll come out on top. A new steampunk fantasy series with eccentric characters, plenty of laughs, and freshly baked croissants with jam! Tales of Peavley Manor! A collection of all four Peavley Manor novelettes! Now available at Amazon and other ebook sellers! Look for the debut novel in 2018! Read Alice’s debut novelette, “Book Fair Frenzy (Or, Macalley Turns The Page)” here on this website! Get the second Peavley Manor novelette, “The Thorn Harbour Road Rally (Or, Macalley Takes The Wheel)”, for free by subscribing to the Robert Dahlen mailing list! Read a preview here!